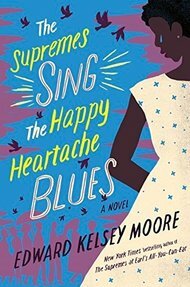 The Supremes Sing the Happy Heartache Blues -- click here. I loved Miss Beatrice, but she was so extravagantly and annoyingly devoted to the Lord and to making sure that everybody else was, too, that being around her for too long had a way of shattering my resolve to keep His Commandments. Over the years, she’d pushed me to take the Lord’s name in vain more times than I’d like to recall. And Miss Beatrice had driven everyone I knew to think about murder at least once. The groom was Mr. Forrest Payne, the owner of the Pink Slipper Gentlemen’s Club, the only legally operating business in Plainview that had ever been called scandalous. The club had been known for on-site gambling, prostitution, and a flagrant disregard for all liquor laws. There was a time when reputations were ruined and marriages destroyed just because previously respectable men had been seen walking near the Pink Slipper’s door. The club’s unsavory public image scared away many potential customers but served as effective advertising for just as many others. My aunt Marjorie swore that the Pink Slipper was the only place in town to hear the blues done right, as well as the only place to find corn liquor as potent as the killer brew she concocted at home. She was a Pink Slipper regular till the day she died. And when I say “till the day she died,” I mean it. Aunt Marjorie had a fatal heart attack while disarming a man who’d pulled a knife on her during a fight at the club. At her funeral, Forrest Payne comforted Mama by telling her that her sister had passed with her opponent’s knife clutched in her fist and a satisfied grin on her face. The brawls, overt prostitution, and gambling were now history, or so I’d been told. These days, the club was more likely to be spoken of as a respected music venue than as a low dive. Forrest had been rehabilitated, and his business had been purified along with him. The major reason for his rise from social pariah to elder statesman and philanthropist was, at that moment, serenely gliding his way, clutching a bouquet of pale peach roses and silvery-white chrysanthemums. in Hardcover, E-Book, and Audiobook!